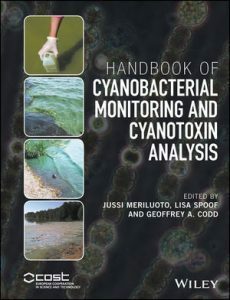 This handbook in concise way present data on ecology of this group, structure and mechanisms of toxicity of the well-known as well not fully recognize cyanotoxins and rules associated with monitoring of cyanobacateria blooms. Moreover this handbook provides 29 standard operating procedures (SOPs) which include detailed instructions to enable the methods to be used for environmental sampling, examination and quantification of cyanotoxins . Additionally separated chapters are focused on invasive cyanobacteria, their expansion and new methods of toxicity assessment based on bioassay and occurrence of cyanobacteria using photosynthetic pigments. This handbook is dedicated to different institutions related to cyanobacterial and cyanotoxins risk management, toxicity examination and aquatic ecosystems protection. Burchardt L. (ed.). 2010. Klucz do oznaczania gatunków fitoplanktonu jezior i rzek. Biblioteka Pomocy Dydaktycznych. Bogucki Wydawnictwo Naukowe. Poznań. Ss.187. Celewicz-Gołdyn S. 2010. Influence of Ceratophyllum demersum L. on phytoplankton structure in a shallow eutrophic lake. Oceanological and Hydrobiological Studies. 121-128. Celewicz-Gołdyn S., Klimko M., Kuczyńska-Kippen N. 2010. Phycological investigations of pelagic vs. littoral zones of shallow lake ecosystems. Biologia, Bratislava. 438-443. Celewicz-Gołdyn S., Klimko M., Kuczyńska-Kippen N., Nagengast B. 2010. Relationship between plankton assemblages and habitat charakteristics of stands of Typha angustifolia and Chara hispida in Lake Wielkowiejskie. Oceanological and Hydrobiological Studies. 127-135. Ferencz B., Dawidek J, Toporowska M. 2014. Hydrochemical versus biological conditions of the functioning of three shallow lakes in Łęczna-Włodawa. Water Environment Research: 86 (3): 269-276. Gąbka M., Owsianny P. M., Burchardt L. 2010. The influence of co-occurring vegetation and habitat variables on distribution of rare Charophyte species Lychnothamnus barbatus (Meyen) in lakes of western Poland. Polish Journal of Ecology. 58, 1: 13-25. Grabowska M., Glińska-Lewczuk K., Obolewski K., Burandt P., Kobus Sz., Dunalska J., Kujawa R., Goździejewska A., Skrzypczak A. 2014. Effectof hydrological and hydrochemicalfactors on the qualitative and quantitative structure of phytoplanktoncommunities in selected floodplain lakes in the Middle Basin of the BiebrzaRiver, NE Poland. Pol. J. Environ. Stud. 23(3): 713-725. Grabowska M., Hindák F., Hindáková A. 2014. Phototrophic microflora of a dystrophic Lake Sęczek, Masuria,Poland, Oceanol. Hydrobiol. Stud. 43 (4): 337-345. Grabowska M., Mazur-Marzec H. 2014. Vertical distribution of cyanobacteria biomass and cyanotoxin productionin polymictic Siemianówka Dam Reservoir. Archives of Polish Fisheries 22 (1): 41-51. Grabowska M., Mazur-Marzec H. 2011. The effect of cyanobacterial blooms in the Siemianówka Dam Reservoir on the phytoplankton structure in the Narew River. Oceanological and Hydrobiological Studies. 40(1) 19-26. Grabowska M., Ejsmont-Karabin J., Karpowicz M. 2013. An impact of rotifer and crustacean community from hypertrophic reservoir on species composition and abundance of river zooplankton. Pol. J. Ecol. 61 (4) 757-766. Grabowska M., Wołowski K. 2014. Development of Trachelomonas species (Euglenophyta) during blooming of Planktothrix agardhii (Cyanoprokaryota). Ann. Limnol. – Int. J. Lim.50: 49-57, DOI: 10.1051/limn/2013070. Hindák F.Hindáková A. 2012. Ettliella tetraspora (Chlorophyta, Chlorophyceae): life cycle and taxonomy. Fottea 12/1: 75-81. Hindák F., Wołowski K., Hindáková A. 2011. The epilithon of a cooling tower of the power plant at Bełchatów, Poland. Oceanological and Hydrobiological Studies, Gdańsk, 40/4: 38-43. Jakubowska N., Zagajewski P., Gołdyn R. 2013. Water Blooms and Cyanobacterial Toxins in Lakes. Polish Journal of Environmental Studies 22(4). 1077-1082. Jekatierynczuk-Rudczyk E., Zieliński P., Grabowska M., Ejsmont-KarabinJ., Karpowicz M., Więcko A. 2014. The trophic status of Suwałki Landscape Parklakes based on selected parameters (NE Poland). Environmental Monitoring and Assessment, 186: 5101-5121, DOI:10.1007/s10661-014-3763-0. Joniak T., Klimaszyk P., Kraska M. 2010. Diel dynamic of vertical changes of chlorophyll and bacteriochlorophyll in small humic lake. Oceanological and Hydrobiological Studies 39 (3). 103-111. Joniak T., Kuczyńska-Kippen N. 2010. The chemisty of water and bottom sediments in relation to zooplankton biocenosis in small agricultural ponds. Oceanological and Hydrobiological Studies 39 (2). 85-96. Kentzer A., Dembowska E., Giziński A., Napiórkowski P. 2010. Influence of the Włocławek Reservoir on hydrochemistry and plankton of a large, lowland river (the Lower Vistula River, Poland). Ecological Engineering: 1747-1753. Kobos J., Błaszczyk A., Błońska M., Budzyńska A., Grabowska M., Hebel A., Kokociński M., Kownacka J., Messyasz B., Napiórkowska-Krzebietke A., Nawrocka L., Pełechata A., Rybak A., Sutryk K., Toporowska M., Toruńska A., Zagajewski P., Złoch I., Mazur-Marzec H. 2013. Cyanobacteria and cyanotoxins in Polish freshwater bodies. Oceanol. Hydrobiol. Stu. 42 (4): 358-378. Komárek, J., Zapomelová, E., Hindák F. 2010. Cronbergia, a new cyanobacterial genus with special strategy of heterocyte formation. Cryptogamie/Algologie, 31(3): 321-341. Lamentowicz Ł., Gąbka M., Rusińska A., Sobczyński T., Owsianny P. M., Lamentowicz M. 2011. Testate Amoeba (Arcellinida, Euglyphida) Ecology along a Poor-Rich Gradient in Fens of Western Poland International Review of Hydrobiology. 96, 4: 356-380. Ligęza S., Wilk-Woźniak E. 2011. The occurrence of a Euglena pascheri and Lepocinclis ovum bloom in an oxbow lake in southern Poland under extreme environmental conditions. Ecological Indicators: 925-929. Mazur-Marzec H., Browarczyk-Matusiak G., Forycka K., Kobos J., Pliński M. 2010. Morphological, genetic, chemical and ecophysiological characterisation of two Microcystis aeruginosa isolates from the Vistula Lagoon, southern Baltic. Oceanologia. 127-146. Mazur-Marzec H., Sutryk K., Kobos J., Hebel A., Hohfeld N., Błaszczyk A., Toruńska A., Kaczkowska M.J., Łysiak-Pastuszak E., Kraśniewski W., Jasser I. 2013. Occurence of cyanobacteria and cyanotoxin in the Southern Baltic Proper. Filamentous cyanobacteria versus single-celled picocyanobacteria. Hydrobiologia. 235-252. Napiórkowska-Krzebietke A., Hutorowicz A., Tucholski S. 2011. Dynamics and structure of phytoplankton in fishponds fed with treated wastewater. Polish Journal of Environmental Studies 20(1). 157-166. Napiórkowska-Krzebietke A., Pasztaleniec A., Hutorowicz A. 2012. Phytoplankton metrics response to the increasing phosphorus and nitrogen gradient in shallow lakes. Journal of Elementology 17(2). 289-303. Nawrocka L., Kobos J. 2011. Assessment of the Vistula Lagoon trophy based on selected biotic and abiotic parameters according to Water Framework Directive. Oceanologia. 881-894. Obolewski K., Glińska-Lewczuk K., Jarząb N., Burandt. P., Kobus S., Kujawa R., Okruszko T., Grabowska M., Lew S., Goździejewska A., Skrzypczak A. 2014. Benthicinvertebrates in floodplain lakes of a polish river: structure and biodiversityanalyses in relation to hydrological conditions. Pol. J. Environ. Stud. 23 (5):1679-1689. Pawlik-Skowrońska B., Toporowska M. 2011. Blooms of toxin-producing Cyanobacteria – a real threat in small dam reservoirs at the beginning of their operation. Ocenological and Hydrobiological Studies: 40/4 (30-37). Pełechaty M., Pukacz A., Apolinarska K., Pełechata A., Siepak M. 2013. The significance of Chara vegetation in the precipitation of lacustrine calcium carbonate. Sedimentology 60: 1017-1035. Pęczuła W. 2013. Influence of barley straw (Hordeum vulgare L.) extract on phytoplankton dominated by Scenedesmus species in laboratory conditions: the importance of the extraction duration. Journal of Applied Phycology 25. 661-665. Piontek M., Czyżewska W. 2012. Efficiency of drinking water treatment processes. Removal of phytoplankton with special consideration for Cyanobacteria and improving physical and chemical parameters. Polish Journal of Environmental Studies 21(6): 1797-1805. Piontek M., Walczak B., Czyżewska W., Lechów H. 2012. Copper, cadmium and zinc contamination in the road dust and their toxicity determined using biological method. Kosmos 3(296): 409-415. Pliński M., Owsianny P. M. 2011. Flora Zatoki Gdańskiej i wód przyległych (Bałtyk Południowy). Bruzdnice – Dinoflagellata (Dinoflagellates) (with the English key for the identification to the genus). Wydawnictwo Uniwersytetu Gdańskiego. Gdynia. Ss. 164. Płachno B.J., Łukaszek M., Wołowski K., Adamec L., Stolarczyk P. 2012. Aging of Utricularia traps and variability of microorganisms associated with that microhabitat. Aquatic Botany. 44-48. Pukacz A., Pełechaty M., Pełechata A. 2013. The relation between charophytes and habitat differentation in temperate lowland lakes. Polish Journal of Ecology: 61, 1: 105-118. Sobczyński T., Joniak T., Pronin E. 2012. Assessment of the multi-directional experiment of restoration of Lake Góreckie (western Poland) with particular focus to oxygen and light conditions: first results. Polish Journal of Environmental Studies 21 (4). 1025-1031. Toporowska M., Pawlik-Skowrońska B., Krupa D., Kornijów R. 2010. Winter versus summer blooming of phytoplankton in a shallow lake: effect of hypertrophic conditions. Polish Journal of Ecology: 58 (3-12). Toporowska M., Pawlik-Skowrońska B., Kalinowska R. 2014. Accumulation and effects of cyanobacterial microcystins and anatoxin-a on benthic larvae of Chironomus spp. (Diptera: Chironomidae). European Journal of Entomology: 111 (1): 83-90. Toporowska M., Pawlik-Skowrońska B. 2014. Four-year study on phytoplankton biodiversity in a small hypertrophic lake affected by water blooms of toxigenic cyanobacteria. Polish Journal of Environmental Studies: 23 (2): 491-499. Wilk-Woźniak E., Ciszewski D., Pociecha A.,Aleksander-Kwaterczak U. 2011. Pattern of algal diversity in fishponds contaminated with heavy metals (Upper Silesia, Poland). European Journal of Phycology, Supplement 192. Wilk-Woźniak E., Pociecha A., Ciszewski D., Aleksander-Kwaterczak U., Walusiak E. 2011. Phyto- and zooplankton in fishponds contaminated with heavy metal runoff from a lead-zinc mine. Oceanological and Hydrobiological Studies. 77-85. Wiśniewska M. 2010. Phytoplankton dynamics in the reservoir lake „Żur” on the pomeranian Wda River. Ocenological and Hydrobiological Studies: 39/4 (157-171). Wiśniewska M., Luścińska M. 2012. Long-term changes in the phytoplankton of Lake Charzykowskie. Ocenological and Hydrobiological Studies: 41/3 (90-98). Wiśniewska M., Paczuska B. 2013. Dynamics of the phytoplankton community in mesotrophic Lake Borówno. Ocenological and Hydrobiological Studies: 42/2 (202-208). Zębek E. 2010. Comparison of diatom communities at the natural and anthropogenic character stations in the littoral zone of the urban Lake Jeziorak Mały. Ekológia (Bratislava): 29(4). 441-453. Zębek E., Bonar A., Szymańska U. 2012. Periphytic diatom communities in the littoral zone of the urban lake Jeziorak Mały (Masurian Lake District, Poland). Ekológia (Bratislava): 31(1) 105-123. Zieliński P. Ejsmont-Karabin J., Grabowska M., Karpowicz M. 2011. Ecological status of shallow Lake Gorbacz (NE Poland) in its final stage before drying up. Oceanological and Hydrobiological Studies: 40(2) 1-12.